bloom, put on by Modern Times Stage Company at the Buddies in Bad Times Theatre, is a quasi-memory play set in a dystopian future ravaged by endless war. In this world — or what’s left of it — the past cannot be buried, but whether or not that’s a good thing depends on your perspective. The play is based on T.S. Eliot’s poem The Waste Land, but it is not a direct adaptation, thus reading the play prior to seeing this production is not necessary. Themes and narrative style are borrowed, especially the sense of post-war disillusionment. But from the soil laid down by Eliot, playwright Guillermo Verdecchia grows his own story. We follow a war orphan trying to piece together his past, while his guardian, a veteran, wants to forget his own. The fact that bloom is adapted from a poem is both its strength and weakness. We are treated to vivid imagery through the text and, combined with the sound and lighting design (Thomas Ryder Payne and Michelle Ramsay respectively), we get a solid sense of the broken world that exists beyond what’s seen on stage. However, some of the performance feels like people reciting lines and verse rather than having an organic conversation. The notion that poetry can endure into the post-apocalypse, however, is a lovely concept. In fact, it injects some of that optimism we so need to get us through bleak times. 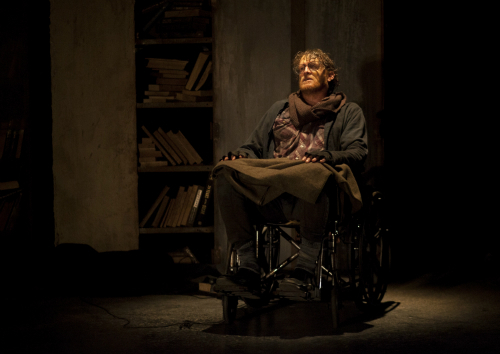 The veteran (Peter Farbridge) is charming and sympathetic even when we delve into his sordid history. Rather than being a brooding macho man, his character is a war veteran by way of J.R.R. Tolkien, filtered through Cormac McCarthy’s The Road. Although quirky and clever, we soon find this serves as a mask for his trauma and guilt. The boy (Liz Peterson) keeps up the show’s energy, albeit in a brutish way. Though jarring at first, you soon realize that, as a war orphan, the child never received the kind of socializing we’ve grown accustomed to. Although both performed with nuance and clear thought put into their roles, the boy and the veteran needed more chemistry. Some of their scenes were touching, but the bond they had formed didn’t feel consistent overall. As far as the story goes, the plot revelations are not surprising, but the story is more about the emotional experience and the impact of actions, rather than the drama of the actions themselves. This is a play about feeling, memory, and how the former can distort the latter, but this does mean it can be disorienting. People who process things in a more structured way might have a hard time with this piece because it doesn’t always explain things explicitly. My guest did tell me that he had trouble understanding what was happening, particularly towards the ending where scenes and their staging felt like non-sequitors. This is meant to be a psychological, feeling piece, but I’m not sure whether or not confusion was one of the intended effects. But still, I appreciated the other feelings this show instilled in me — most of all, hope. If this production sounds like a lot to take in, you’d be right, but with a little patience, it proves worth it to listen to what bloom has to say. Audience Advisory: This production contains loud noises, adult language and sexual themes. Viewer discretion is advised.